Sometimes I’m just in the mood for hearts. We suffered a small Valentine’s tragedy. Our then school announced that Valentine’s day would no longer be celebrated at school. Parents received an email urging us “not to buy into the hype” of cards and candy. The children were informed that they would observe a “Respect for All Day” instead. I had such fond memories of giving and receiving Valentine’s notes and cards as a kid. I was sad to see another holiday banned from school. My littler guy reluctantly put away the handmade crafts he’d prepared for his classmates. I attempted to cheer him up by promising a special celebration at home. Or, “Respect for All Day” if you want to be PC about it. My six year old came home weeping as if his heart had broken. Not all the teachers had obeyed the memo. He had witnessed kindergarten teachers clandestinely stuffing little decorated brown paper bags with colorful Valentine’s treats their students had prepared for each other. For months he cried over that memory. Think I’m still a little scarred from all of that. What mom doesn’t hurt when her kid is hurting? In a new town and a new school. And are allowed to bring decorated bags to collect their own cards and treats. He wrinkled his nose and said he didn’t care. But damned if I was going to let him miss out on this childhood rite. He didn’t want to decorate a bag. “I’ll just use a paper bag,” he said. I countered with the offer to sew one for him. I’d make it with my favorite grey felt. It’d be heavy enough to stay standing like a basket on his desk. But would have handles and could double as a bag when he was ready to come home. 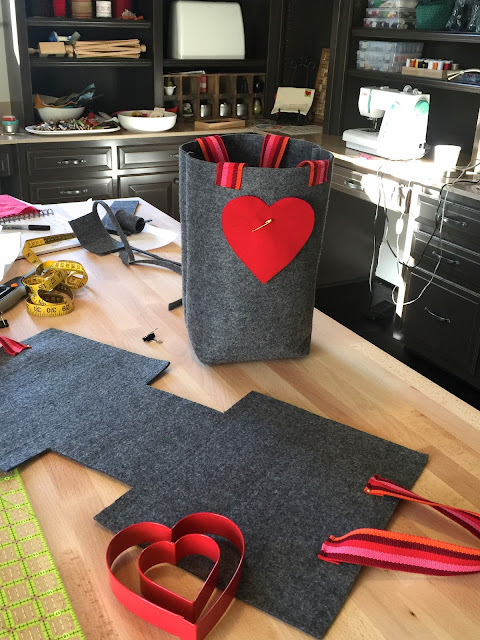 Would he agree to just one red felt heart pinned to the bag? 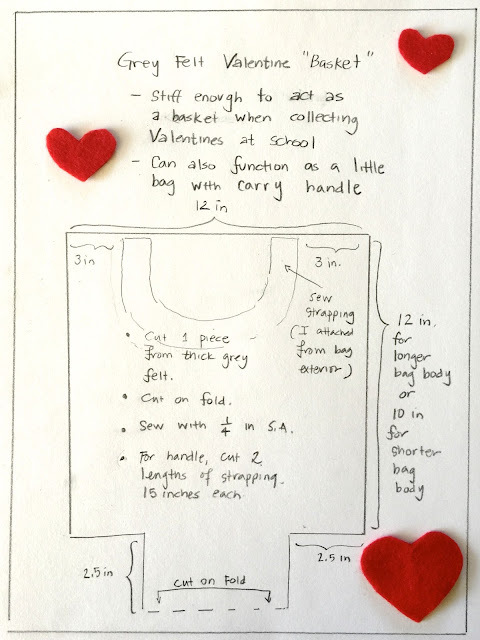 (Dimensions and details for bag outlined in above picture). 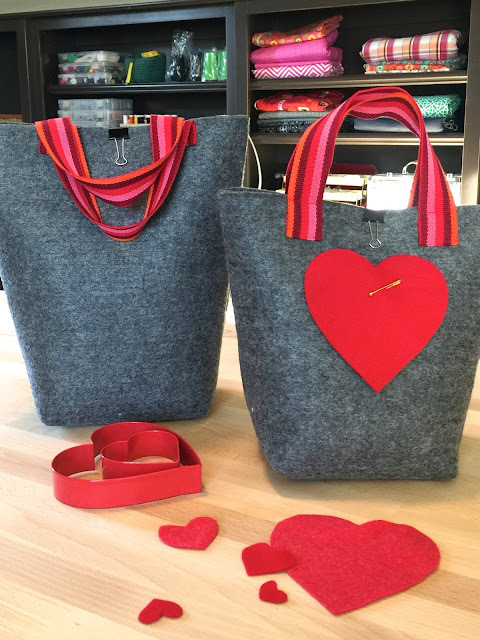 Plain grey felt and one red heart felt a little too plain. I took a risk and added Valentine’s colored strapping for handles. Made a short version of the basket/bag. He claimed the shorter bag. Now we just need to assemble the treats and cheesy message he’ll be handing out in class. Maybe he’s just a good kid and has been humoring me. Maybe I’m still trying to make it up to that six year old who was so devastated when his school banned Valentine’s Day. He really still loves the idea of Valentine’s. I’m just glad he gets to experience this bit of fun. 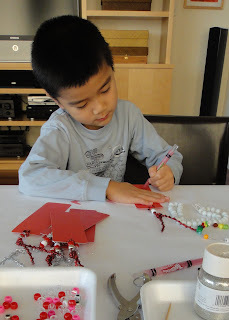 Happy Valentine’s to my E.
Ethan and I made Valentine bookmarks yesterday. We had a great time crafting these and are really happy with our results. If you’d like to know how we made our bookmarks, please read on! And our Valentine bookmark is ready to go! Ethan and I worked on the bookmarks before and after school yesterday. He was in charge of punching the corners, coloring in the squares and sorting out the beads. We planned for him to give these out to his class. 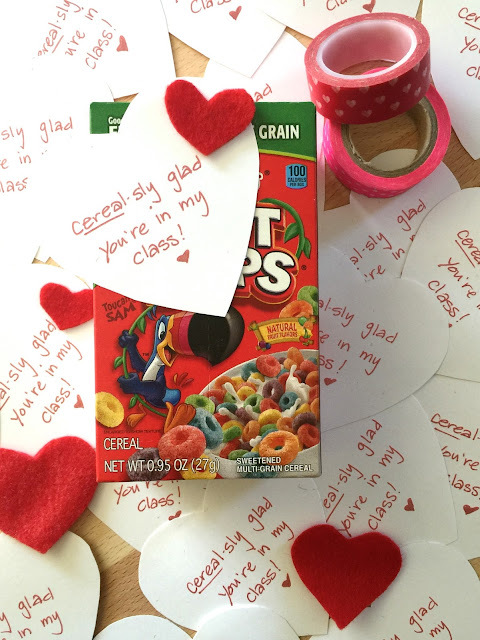 We powered through 36 bookmarks before I thought to check with his teacher – will their class be celebrating Valentines? Are we allowed to hand these out? What do you think the answer to that is? Turns out, E’s class is not celebrating Valentines … they’re going to celebrate the 100th day of school instead. Each child is supposed to bring in 100 creative somethings. E suggested we keep making bookmarks until we hit 100. Simon offered to take our crafts to his class since they will be exchanging Valentines. Si grinned like the Cheshire cat the whole time because this meant he would neither need to buy or make his own Valentines. E and I rolled our eyes at each other. We gifted our freshly crafted bookmarks to Simon. Then we put our heads together to begin planning what kind of something we’d like to make 100 of.